Former Inspector General of Police Jayantha Wickramaratne will be arrested over the alleged involvement in the murder of senior journalist Lasantha Wickramatunge, if sufficient evidence is collected, Senior State Counsel (SSC)Janaka Bandara revealed to the Mount Lavinia Magistrate yesterday (12). Bandara made this statement in response to the appeal submission made by suspect Deputy Inspector General of Police Prasanna Nanayakkara, represented by President’s Counsel Anura Maddegoda. Bandara further noted that the Supreme Court ruled in favour of the fundamental rights petition filed by Wickramaratne, due to the lack of evidence against him at that time. 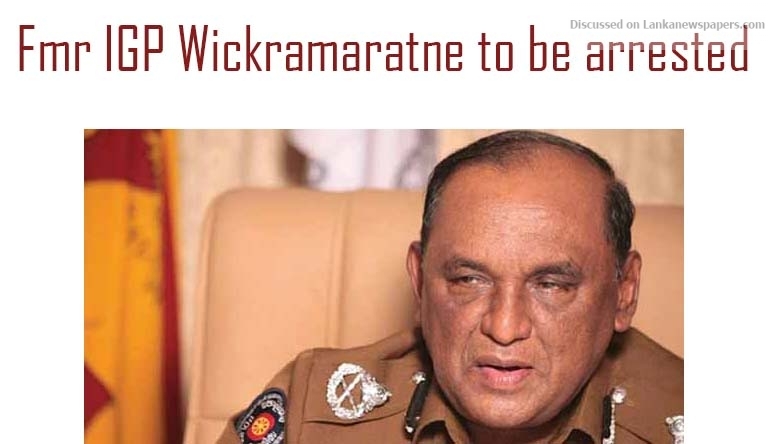 However, Bandara emphasized, if the investigating officers compiled sufficient evidence against Wickramaratne, his arrest will be unavoidable. Both suspects arrested over the murder and cover up of the incident – former Crimes Officer-In-Charge of the Mount Lavinia Police Tissa Sugathadasa and Nanayakkara – were produced in Court yesterday. Assistant Superintendent of Police Tissera and Chief Inspector Nishantha Perera represented the Criminal Investigation Department while Bandara appeared for the Attorney General. Bandara further noted that if the suspects are granted bail, it will prove to be an impediment to the ongoing investigation. Accordingly, he noted that the Attorney General’s Department is yet to make a decision with regard to the confidential statement made by suspect Sugathadasa to the Magistrate, in order to name him as a State witness. Bandara further emphasized that the murder was carried out by several groups of individuals, assisted by the third suspect Nanayakkara, and thus, bail cannot be granted to the suspects without impeding the ongoing investigation. However, Maddegoda denied that his client has tampered with evidence in the case. He noted that his client has been wrongfully arrested based on the statements made to the Police by the second suspect Sugathadasa. Magistrate Mohammed Mihal taking note of the submissions directed that the appeal submissions will be taken into consideration again on 19 June. The two suspects were further remanded until the next Court date. Former IGP is to be arrested since dawn !